Today, i’m talking about how to download, install and run BackTrack in Windows Xp, Windows 7and Windows 8. 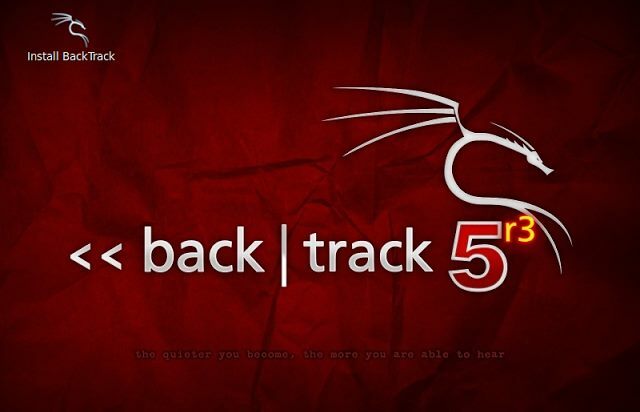 BackTrack is a Linux-based penetration testing arsenal that aids security professionals in the ability to perform assessments in a purely native environment dedicated to hacking. I wanted to run Linux on Windows but i never wanted to install it directly. So what i did is that i installed it in a Virtual Environment. Which means you can use Windows and run another Operating System while using Windows. This can be achieved through a Software like VMware or VirtualBox. The subject of this thread consist of Backtrack. You can download BackTrack Linux from their Official Website. 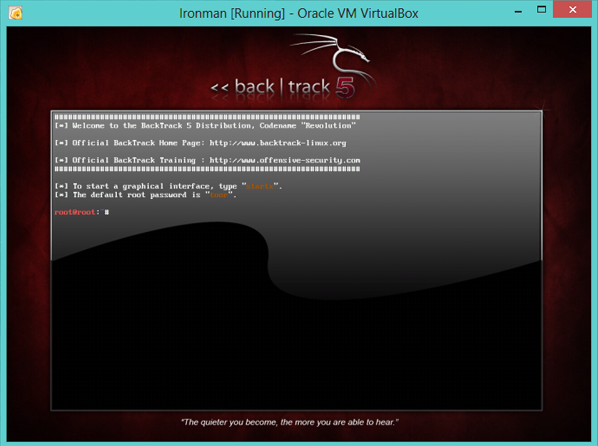 Now in this post i am going to show you how to install Backtrack 5 using VirtualBox on Windows. To run a Operating System in a Virtual Environment, We will need a Virtual Machine Tool. And in this case i am using Virtual Box. Why VirtualBox? Because its free ! And it is a powerful virtualization product. To get Virtual Box, Download from here. 1. To create a virtual machine, let us start the VirtualBox and click the “New” virtual machine button in the tool bar. 3. Enter any name for the Virtual Machine, For Example: Ironman Then choose the type of OS as Linux and Version as Other Linux. Since my computer holds 6 GB of RAM, I am allocating about 1 GB of it to the Virtual Machine. And don’t worry, this is not permanent allocation. The memory will be taken back by your computer after you shut down Virtual Machine. 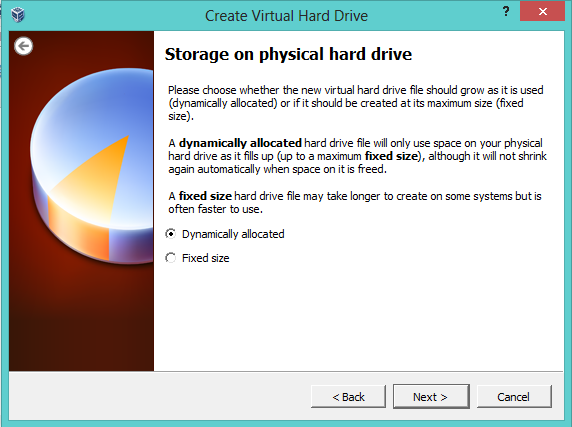 The template will further guide you to create a virtual hard drive for the virtual machine. The virtual hard drive is simply a file on your host computer. This file will consist all the data of the OS which you are about to run in VirtualBox. 5. Just select ‘Create a virtual hard drive now’ and Click Create. 6. Then it asks you to choose Hard drive file type. 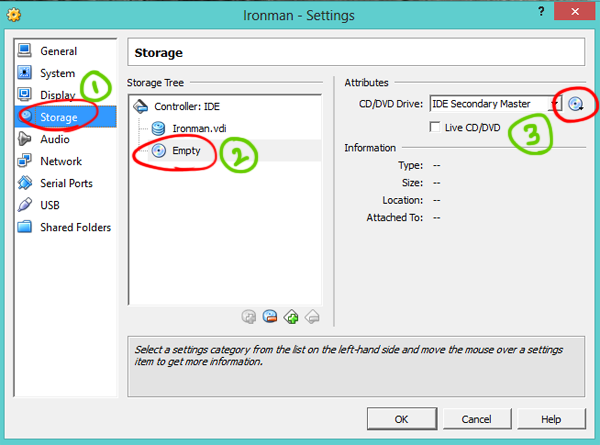 Select the default VDI (Virtual Disk Image) and hit Next. 7. Then after you have to select ‘Dynamically allocated’ and hit Next. 8. And now comes the important part. You have to select the Size of Virtual Drive. I have given about 2.5 GB of disk space for Virtual Machine. You can give more or less according to your wish. 11. In the window above, you have to select Storage, then select Empty. And finally select the disc icon on the rightmost side. Which would open up a drop down menu. 12. Now select ‘Choose a virtual CD/DVD dis file’ and browse to the directory where your ISO or Image file is stored. In this case i will just browse and select BT5.ISO image from my hard drive. And just click OK.
13. Now everything is set up. All you need to do is click ‘Start‘. 14. After you hit Start, The Virtual Machine boots up. Then it loads up the OS (in this case – BackTrack 5). You might need to hit Enter so BackTrack starts booting.